Grass Spiders are usually light brown with darker brown stripes. They spin a funnel-like web close to the ground that isn't sticky, but these spiders are super fast and can catch their prey without needing to stick them in a web. 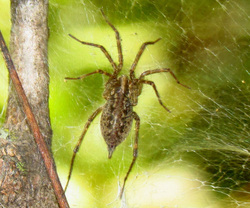 Grass Spiders live in grassy areas and small shrubs. Their venom is not harmful to humans. Click here to learn more about the Harvestman Spider!